Product prices and availability are accurate as of 2019-04-14 01:09:39 BST and are subject to change. Any price and availability information displayed on http://www.amazon.co.uk/ at the time of purchase will apply to the purchase of this product. 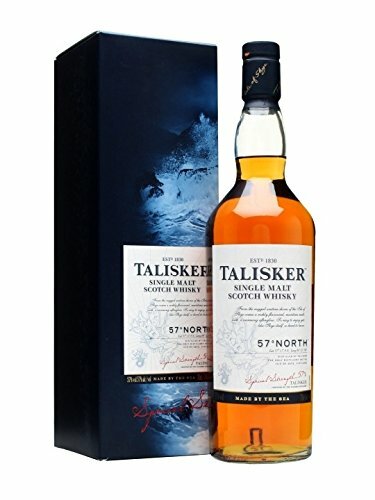 A distillery-bottled cask strength Talisker, 57' North is deceptively smooth for a whisky at this strength, but still a muscular presence on the palate, with the pepper and chilli Talisker hallmarks very much in evidence. Picked up the top prize in its category (Best Island No Age) at the World Whisky Awards 2012. Case of 6 ABV: 57% Scotch Malt Whisky from the Island Regions of Scotland Savour it neat, on ice, with a mixer or in a cocktail. It is an offence for any person under 18 years to buy or attempt to buy alcohol. Please drink responsibly.